Home DIY Projects	A Hogwarts Chandelier? Happy Wednesday, Friends! 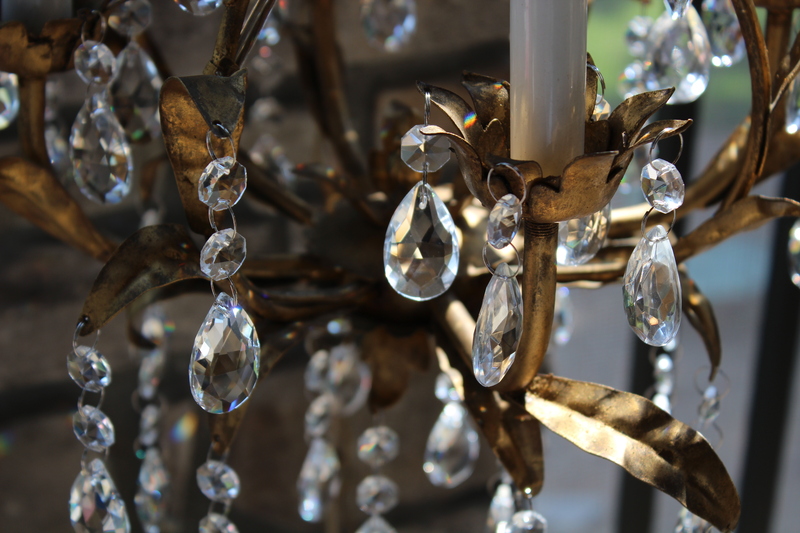 This is a follow up story about a chandelier I revamped for a very special young lady. When we lived in Doylestown, my sweet little next door neighbor nicknamed me her Fairy-Godmother. Probably because I loved to give her (and her sweet brother) home baked cookies and goodies. Thus, she became my Fairy-Goddaughter. Come see her “Hogwarts Chandelier”! This chandelier has a beautiful shape but just needed a little TLC. Plus, the amber crystals were not what I had in mind for a pre-teen girl’s room. We moved, I dug it out of storage and had it put on a plug and switch. Then, using my favorite paint for chandeliers, I dry brushed on some Rub ‘n Buff in Gold Leaf. You can see how the gold leaf paint really brings out the beautiful details in the metal. I added the little acorn finial because that place on the chandelier was clearly missing something. I had this little charmer in my stash and it screwed right on. It fit perfectly! The gold leaf over the original patina is perfection in my book! And here is the chandelier all spruced up with a fresh layer of paint. I carefully packed the chandelier in bubble wrap and packing paper. I included a set of white ceiling hooks and light bulbs wrapped separately. And off to Doylestown it went! I couldn’t wait for Reagan to get her surprise in the mail. And her sweet Momma sent me a few pictures of the chandelier hanging in Reagan’s room. Isn’t it so pretty and feminine? They recently redid her room in a Harry Potter theme, which is perfect for the pre-teen girl she is. On the wall behind the chandelier is a painting of Hogwarts. And what goes better with a castle than a crystal chandelier? I LOVE it! Here’s a quick before and after. Just a bit of paint, some crystals, and a whole lot of tender, loving care. This was such a fun project for me. It combined two things I love, my fairy-goddaughter and chandeliers! Photo credit of Reagan’s chandelier in her room goes to her Mother, the talented photographer and my friend, Libby Hansen Smith. Thank you, Libby for sending these pictures! It makes me so happy! Beautiful story…so sweet 💕 Thanks for sharing such a great gesture!!! I love reading your posts! Thanks for sharing your talents with us. Awe! Thank you so much, Peggy! You are so sweet to say so. I really appreciate your support and kind words!